Ocean Kayak Gold Rush Fishing Competition Announced. 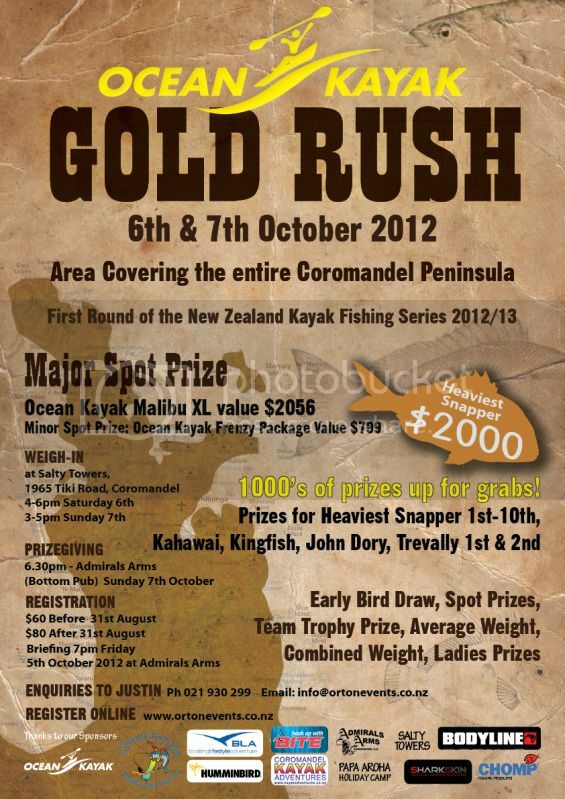 Following on from the huge success of the 2011/12 New Zealand Kayak Fishing Series Orton Events have set up the 2012/13 series and the first competition of the series is the Ocean Kayak Gold Rush held in Coromandel Town on October 6th and 7th. Where will the briefing be held mental? the Arms or the Towers? Tara Yakka wrote: Where will the briefing be held mental? the Arms or the Towers? No breifings at these comps guys so you can just head to your fishing spot . The poster says there is a briefing 7pm on the Friday but I don't know where, I'll follow up with Justin. I think you will find that has been changed for this season KK. Mental wrote: The poster says there is a briefing 7pm on the Friday but I don't know where, I'll follow up with Justin. This might be a first as i dont remember there being a briefing in any of Justins other comps . The boundaries are so large for Justins comps id imagine if there is a briefing it wont be compulsary to attend . Agreed!, maybe a brief written into the online entry and a box that must be ticked "I have read and understood the Ocean kayak Gold rush rules and brief" ???? I'll already have sunk a few by then. Any one keen to enter as a team for this season. I am looking for a partner. Failing that I will just be following team green around harassing them. nzimp wrote: Any one keen to enter as a team for this season. I am looking for a partner. Failing that I will just be following team green around harassing them. This event has suddenly become a very real possibility for me, as is weekend fishing in general. Possibly some very big changes to my employment very soon. You guys and gals may see me a bit more at events soon. Its all very exciting and life changing. Anyone keen on getting a team together, just brainstorming at this stage but will advise of permanent changes in the next 2-3 weeks. 6. There will be a briefing on the friday the 5th at Admirals Arms 7pm. This is compalsary. You will recieve your Ocean Kayak Gold Rush Ticket and Hat which must be worn to get into prize giving and ticket to claim prizes. No exceptions! Breifings are a good idea i guess .... but god knows how you could expect to go to a breifing at say the Bridge To Cape comp then have to drive possibly 2 hours up north or down south to your fishing spot .